The Ascended Masters and Their Messengers in The Temple of The Presence revisited Bozeman, Montana, June 4 - 6, 1999 to present a seminar entitled: "Your Glorious God Presence: The Pearl of Great Rejoicing." I consider this seminar to have been a "back to basics" opportunity - reminding us of the importance of relying on our own Mighty I AM Presence - the God Presence of our Life. The Masters are with us here and now, and through The Temple of The Presence, They desire to convey to us personally Their Love and the Love of our own God Presence. I am always in awe of the Light and Joy that enfolds us whenever our beloved Ascended Brothers and Sisters commune with us. What a stark cold universe this would be if Those who have gone on to Their Immortality in Heaven would choose to turn away from us — leaving us to our own struggles in finding our way back Home to the Heart of our Source! In a series of memorable Discourses inspired by the Ascended Masters and delivered by Monroe Shearer, we were reminded of the importance of maintaining our attention on our Real Self - that Part of our Being that was created - individualized - from the Great "I AM" of all Life. We are all familiar with the Genesis 1:26-28 account of our creation in the Image and Likeness of God. This "Likeness" refers to God's Nature - the Essence of all that He is. Our Real Self - our Individualized God Presence - has a unique and Immortal Identity that is different from every other God Presence. We can realize more of who we are in God by placing our God Presence first, last, and always in our attention and our life. Thus we can gradually decrease the human (limited) consciousness and nature, and increase the Divine (Unlimited) Nature. This is not actually so much an evolution of our consciousness as it is a restoration of the awareness of our Divine God Nature. We have chosen to experience Life in this matter sphere, and we can choose to return again into the Authority of our own I AM Consciousness, drawing Primal Life and getting Direction from our God Presence. In that Mastery and Control of our own life, we can begin to build anew, as our God Self would have us do, until there are not two - the human and God - but GOD alone! Monroe explained that the Christ Self (Higher Mental Body) is a replica of the I AM Presence. It is projected forth from the Electronic Body of the I AM Presence and can be likened to a "step down transformer". The Energy Vibration of the Holy Christ Self is slower than that of the Electronic Body. Both are as tangible in Their own Realms as a physical body is here on the physical plane. The Holy Christ Self is a Body of blazing Light, and is wholly Perfect and will not accept or allow any imperfection into Its Nature. The Christ Self is aware of the limitations and discord around the outer self, but will not accept it. Instead the Christ Discriminating Intelligence can assist us in our return to Oneness with our Source ("our Father") - the "I AM" God Presence of our lifestream. On Friday evening, the beloved Maha Chohan, the Representative of the Holy Spirit for our world, spoke to us in a Dictation through the Messenger, Carolyn Shearer. He reminded us to take the time daily to listen to the Voice of God in the Silence of our Heart. Our outer senses need to be stilled for a time from all the dissonance without. The purified Heart is intended to rule our life, not the outer mind (the "head"). Those who come into our presence should truly be in our Presence - receiving the Blessings and Radiance of our very own God Presence! On Saturday we were graced with a visit by beloved Sanat Kumara. He recalled how He had stood before us long ago as we gave our vows to help in the return of the Earth to the Golden Age. Those who had volunteered to assist Sanat Kumara and the other Kumaras came at a time when there were those in the Earth who did not even have a Threefold Flame. Beloved Saint Germain came later that evening and spoke about those people who have left churches and organizations over the years for one reason or another - as well as those who might leave in the future. 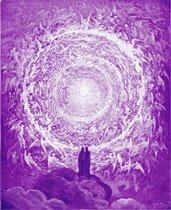 Saint Germain pleaded with us to never leave the Violet Flame - no matter what else we leave behind during our lives in the unascended state. He asked us the question: "Why postpone your Ascension?" He told us that we do not have to leave anything behind that is dear to us. 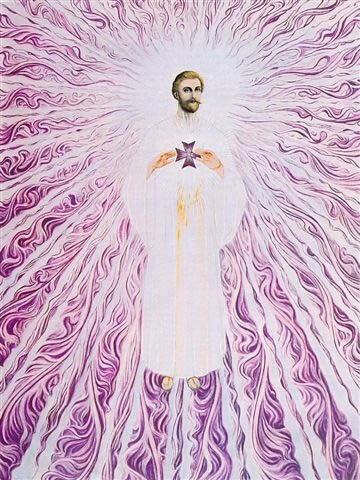 Saint Germain reminded us that we can even take our physical body with us in the Ascension, if we so choose! He ended with a promise: "I will never leave you!" On Sunday afternoon we had the privilege of having Ascended Master Jesus Christ in our midst. Jesus asked: "You have been given Gifts and Graces, why haven't you used them?" He also reminded us that we have not come into the world to call forth pain and suffering upon life. We came into the world to convert that pain and suffering - transmute that pain and suffering - by Divine Love. We came to give Healing, Love, and Comfort to Life. 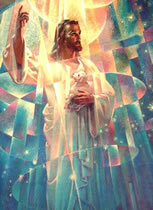 Jesus stated that He would remain on the Earth for a 24 hour period releasing Currents of Love, Peace, and Compassion. We were invited to participate with Him in this Divine Activity during that 24 hour period. "A Kosovo peace deal began to fall back into place Monday as international leaders proposed a United Nations resolution in support of a NATO peacekeeping plan for the devastated Yugoslav province. 'When we began, we had a great deal of dissent,' German Foreign Minister Joschka Fischer said." In His Address to us, Master Jesus also added that it is not enough for us to say "I love" or that "I am sending out currents of love" if our vibration is not Love - if we are not connected to the Heart of our God Presence through our attention and our love. If there are a number of people gathered for decrees in a group, at least someone must be connected to the Presence of God. Beloved Master Morya came unexpectedly in the midst of an informal question and answer session with Monroe and Carolyn Shearer. Morya spoke about the fact that there are people that are attaining their Ascensions across the planet who know nothing about the Ascended Masters' Teachings - as in the case of the recently Ascended Mother Teresa. However, to bring a Golden Age into the physical, there must be those who are trained in the Teachings of the Ascended Masters. Sunday evening beloved Serapis Bey came to admonish us to stop procrastinating on the Goal of the Ascension. He reminded us that the Ascension is just the beginning of Life. That is when Life truly begins to be lived in Its Fullness and Joy! Speaking of Joy, the seminar concluded with the Joyous Presence and Address of beloved Mighty Victory. He told us that He would like the Lightbearers of the planet to keep the mantram "Always Victory" on the tip of their tongues. He promised to be with each of us all the Way to our Victory!